A Mexican cooking class in San Miguel de Allende was high on our to-do list in line with the experiential travel goals of our grand tour. Lara and I had been cooking Mexican food since our first trip in the 1990s but we’d never taken a Mexican cooking class. Had we been doing it right? We were about to find out. 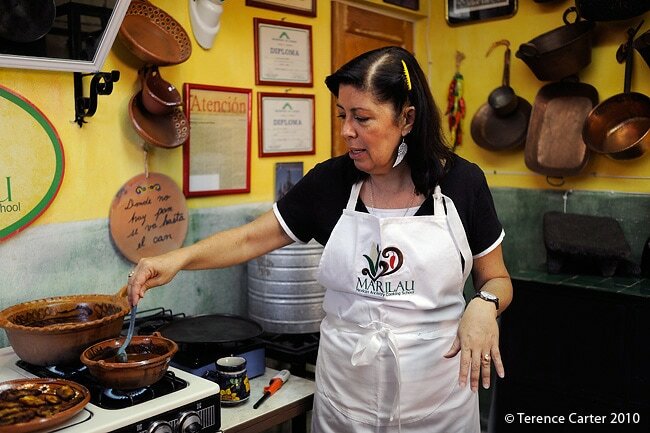 “The focus of my Mexican cooking school is traditional Mexican food, not the cuisine of chefs!” announced Marilau Ricaud, the owner of the Marilau Mexican Ancestry Cooking School, where we’d decided I would do my Mexican cooking class in San Miguel de Allende. 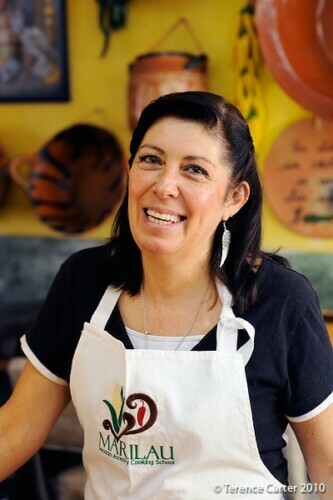 “I felt San Miguel de Allende was lacking in good restaurants to eat Mexican food and I think it’s rare for foreigners to get the opportunity to eat in a Mexican home, so I decided to teach home-cooked food,” Marilau explains, as she hands me an apron. And this is exactly what I was looking for. Not fancy Mexican food. Nor Tex-Mex, which in my opinion, is only good for placing speed humps in front of hangovers late at night. Or blunting their impact the next morning. 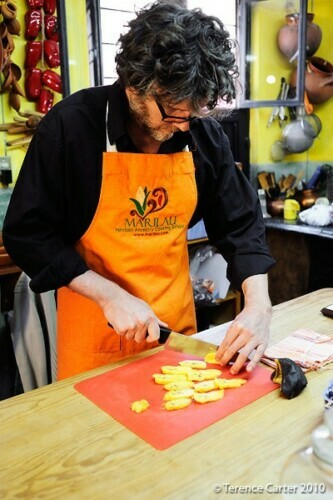 Today I’m learning to cook just three Mexican dishes from San Miguel de Allende that are recipes that Marilau learned from her mother and grandmothers: sopa de tortilla (tortilla soup), the pre-Hispanic dish of pollo en pipian rojo (Chicken in a spicy pumpkin seed sauce), and sarapitos (plantains in tortillas with mole sauce). I love my own recipe of sopa de tortilla and wasn’t keen to find out that I had been making it wrong all those years! I’m not a huge fan of chicken, unless it’s in Thai food (laab gai preferably or chicken satay) or a plump Bresse chicken with skin filled with truffles and butter before a stint in the oven. Plantains are best left for monkeys and mole, in my opinion (Lara loves the stuff), is a horrid concoction best used to disguise mal carne (bad meat). What was I thinking? 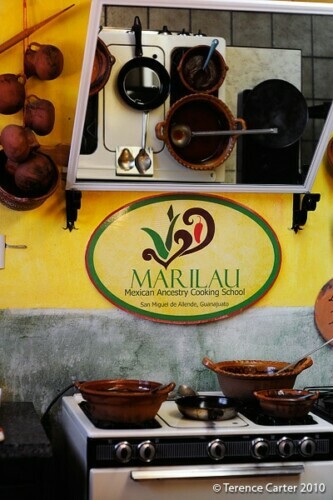 We begin our Mexican cooking class in San Miguel de Allende by prepping what Marilau says is a very local dish. It’s the second course, pollo en pipian rojo, but it will take longer to make. Marilau asks if we eat pork lard, because many participants don’t. “Mexicans never use olive oil – it belongs to the history of Spain, not Mexico. When the Spanish came, Mexico didn’t have olive oil. 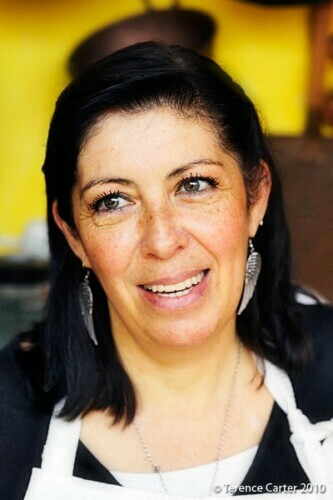 Mexicans always use pork lard,” Marilau insists. Marilau demonstrates how to toast the chiles – for less than half a minute – “simply to wake up the natural oils” – then we add the onions, chicken stock and salt (preferably rock salt), and put a lid on it all to simmer for 10 minutes. After we will blend it. Next, we toast the almonds, then the sesame seeds (“when they pop they’re ready”), and blend these together. Traditionally Mexicans used a metate, a large sloping stone, to grind grain and seeds, but Marilau opts for a blender because she wants people to feel comfortable doing this at home. 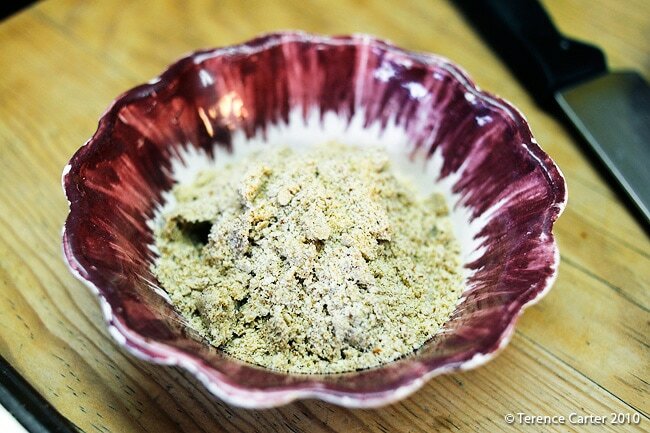 Then we blend the pumpkin seeds separately into a powder as well. We return to our pot on the stove and spoon the contents into the blender to blend the hot chiles and onion to a smooth paste. 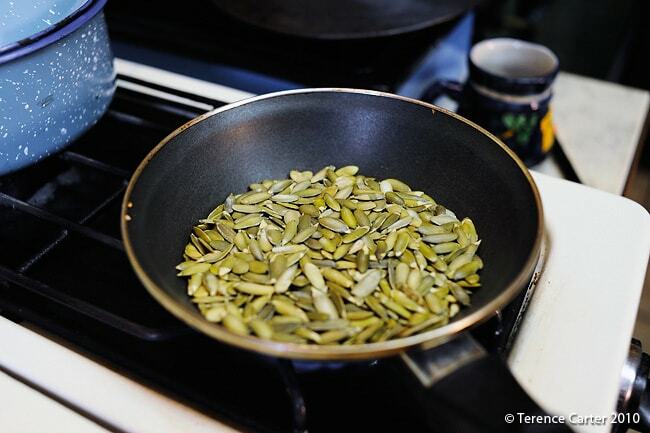 The seeds add an extra taste, but while they season they also thicken. Mexicans never use corn starch or flour, according to Marilau. The sauce now has complexity and a nutty flavour and the fiery heat of the chile has calmed down like a wayward child after dinner. We add the pumpkin seed powder next. 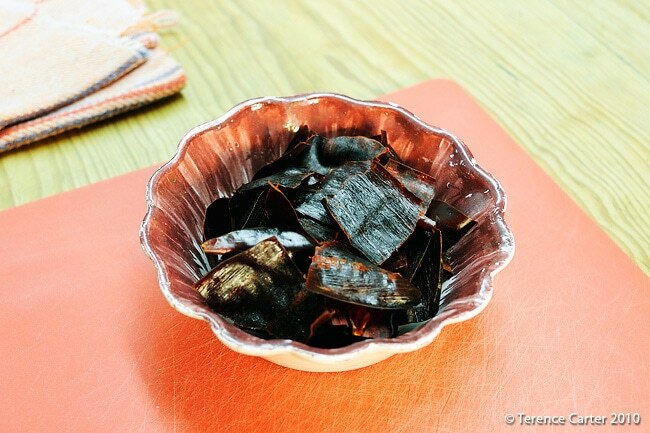 First, we prep our ancho chile, toasting it a little in a pan, then putting it in hot water. 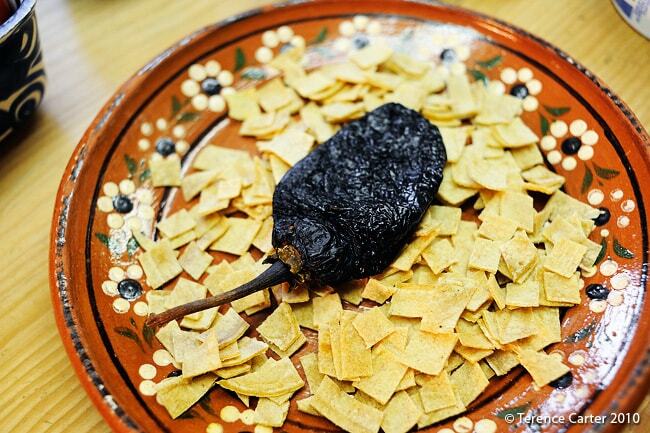 When it’s toasted, we put the chile in hot water and put a weight on top of it. We could also snip it open to allow some hot water inside to reduce the spiciness a little. We put a lid on the pot for 15-20 minutes until it’s soft enough to blend. 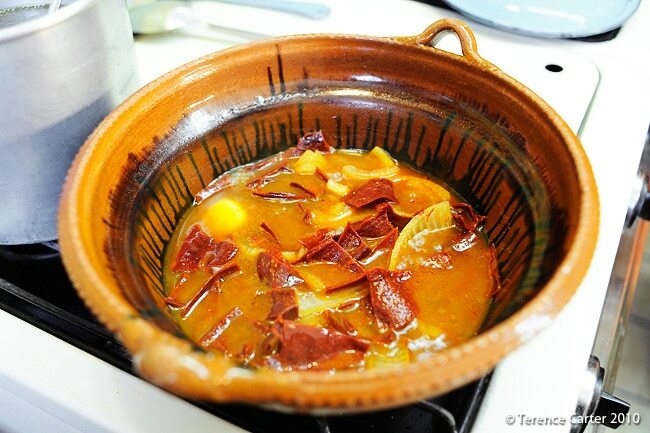 “Soups in Mexico are always light in consistency and texture, due to the weather,” Marilau says, as we chop the tomatoes, a slice of onion and a clove of garlic. 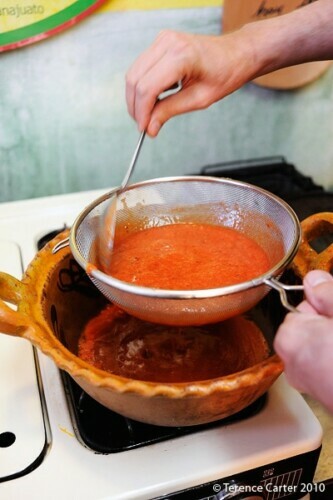 Next, we add one cup of chicken stock, the soft chile – “never touch the inside of it!” – and put it whole into the blender, blend it all together, then strain it just as we did with the salsa. We add salt and pepper and we simmer it all. When the soup has lots of colour, it will be ready. Next, we prep the garnish. 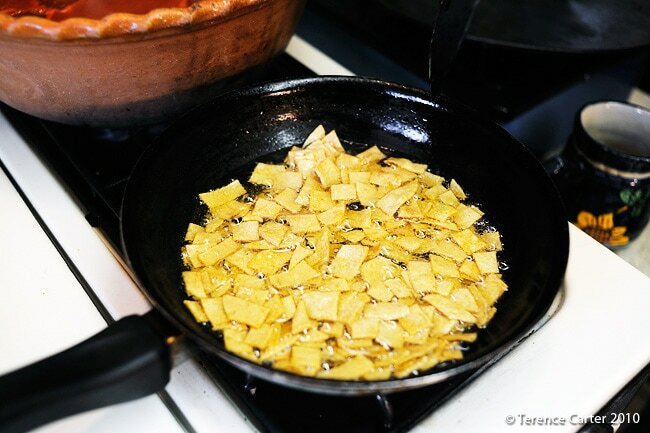 We add vegetable oil to a pan, some small pieces of corn tortillas. Traditionally, tortilla strips are used, but Marilau prefers squares because they stay on the spoon. “The taste is what’s important,” she says. We deep fry the tortilla pieces, and as they should be crispy, not soggy, they should be served alongside the soup with the other garnishes. I think I’ve overcooked them, but Marilau says they’re fine. We chop Manchego cheese (cow’s cheese) into cubes (Marilau warns not to use Spanish goats cheese and to use Gouda if you can’t get Manchego); we put sour cream into a dish (Mexicans never use regular cream, she says); we slice an avocado, scoop out the seed, and cut the avocado into cubes (or slices); and we roughly chop cilantro (coriander for our non-American friends) and put everything on a plate to serve beside the soup. 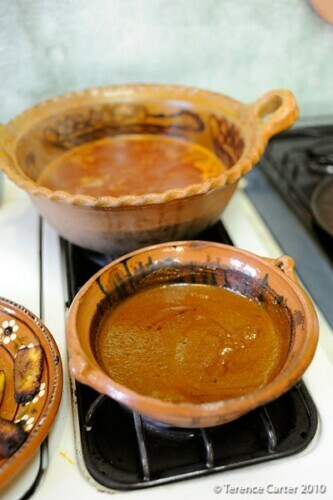 For the dessert, Marilau has already made a batch of mole sauce to her own secret recipe, for which she uses 30 different ingredients. 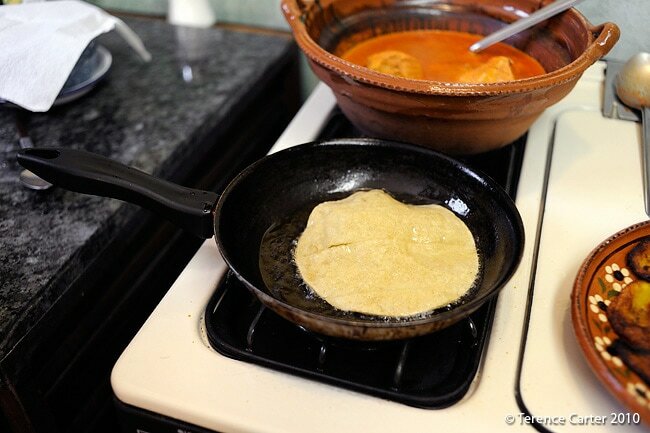 First, we fry whole tortillas lightly on each side. Marilau uses plantains not bananas, and explains the difference: the plantains are hard to peel, unlike a banana, and they also smell sweet and are starchy. 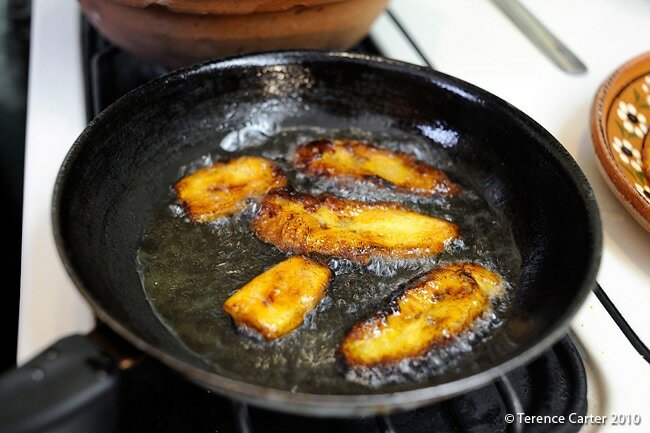 We slice the plantains thinly, then fry them in vegetable oil, turning them over when they’re golden and dark around the edges. 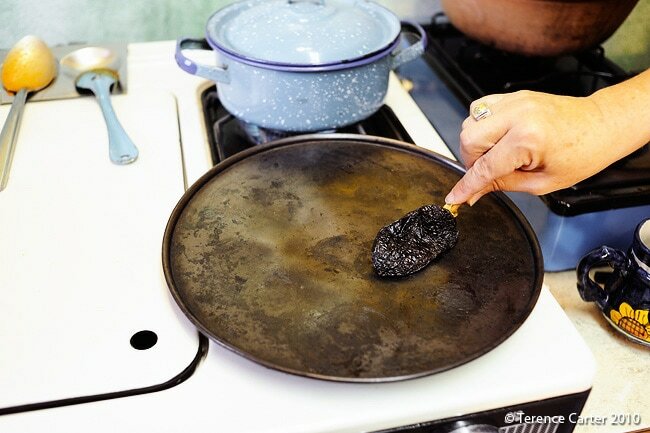 When they’re ready, we put the plantains in the tortilla with a little mole, fold the tortilla in half, and serve more mole on top, sprinkling some sesame seeds on at the end. 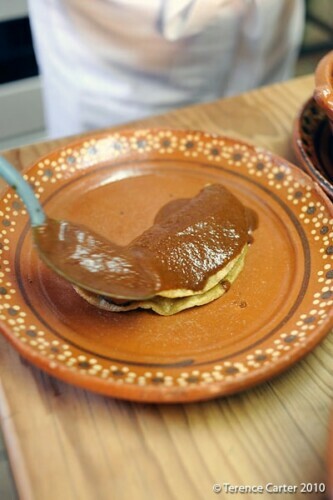 It’s a sweet end to our Mexican cooking class in San Miguel de Allende. 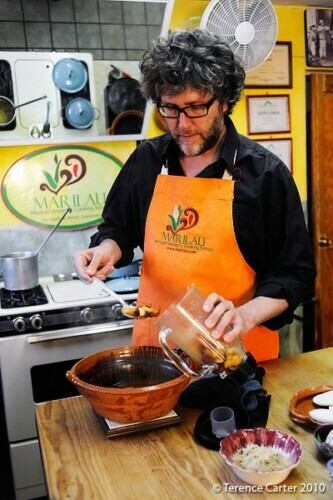 My Mexican cooking class in San Miguel de Allende has been outstanding. Marilau’s charming kitchen is well set up and a fun space to spend a few hours. Marilau is a superb teacher, explaining the process every step of the way while sharing Mexican cooking tips and insights into the history of Mexican cuisine. And the dishes are superb. 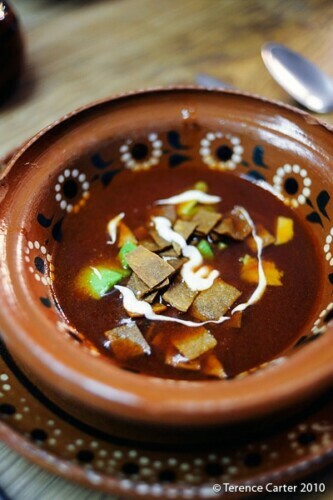 The sopa de tortilla has a delicious flavour but is a little mild for my taste. Marilau suggests I add another chile to the recipe. I also like the idea of the DIY condiments on the side, as they do in Asia. It makes more sense. I used to serve the garnish already on the soup. 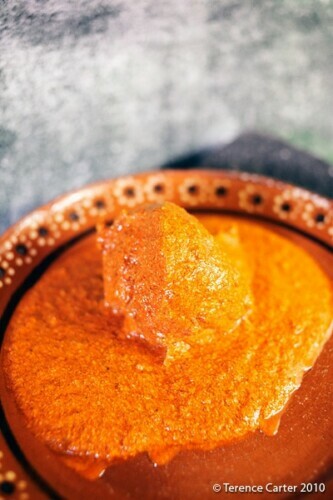 The pre-Hispanic pollo en pipian rojo is fantastic as well and making the sauce was instructional in terms of seeing how the flavours develop complexity and how the initial overt heat of the chili was tamed during the process. The sarapitos are delicious. I’m in shock as I finish the plate in seconds. Had every mole sauce before this one tasted that bad? On this trip they certainly had. Marilau’s mole sauce was a revelation. After the class, Lara and I stroll back to our casita through Marilau’s neighbourhood, along hilly cobblestone streets with ramshackle unrestored houses, where hardly any expats seem to live. Phew. As we pass shops, locals are buying last-minute ingredients like corn tortillas for their lunch, the most important meal of the day. 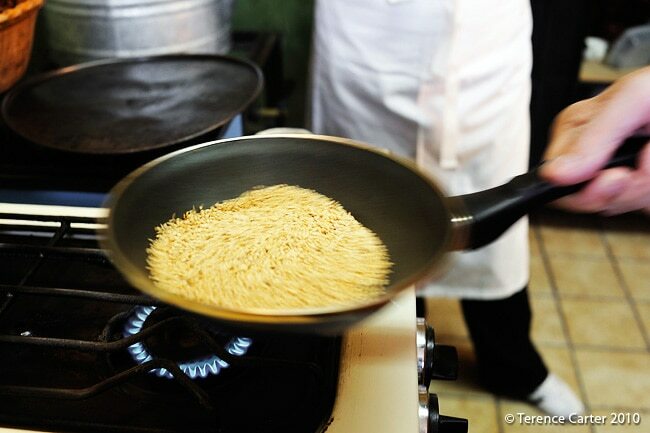 We can pick up the aromas of soup simmering in homes. Marilau will already be enjoying her meal with her family. We now know where the best food in San Miguel de Allende is to be found. And it doesn’t come with an English-language menu, orange cheese, or the ‘ding’ of a microwave. 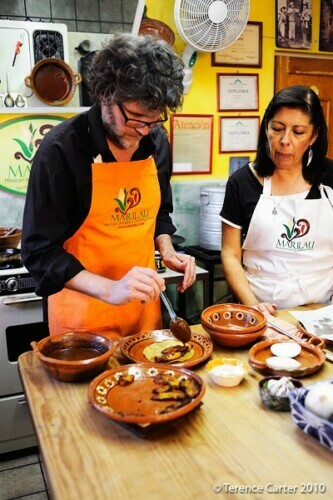 Have you done a Mexican cooking class in San Miguel de Allende? 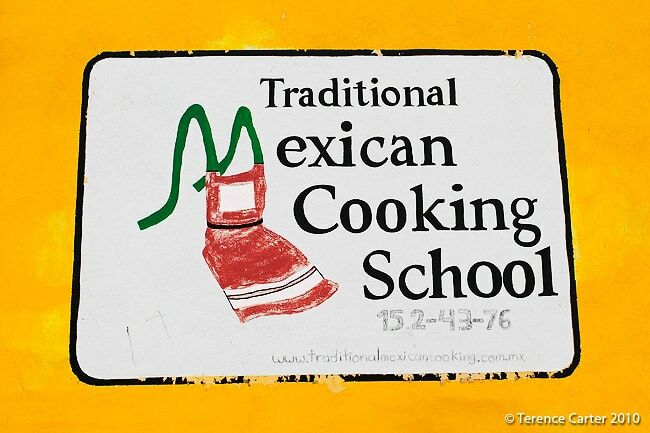 Which Mexican cooking school did you try and how was your experience? We’d love to hear your thoughts in the Comments below. If you like the cuisine of Oaxaca (and I can’t imagine why anyone wouldn’t) then you should pick up a copy of Diana Kennedy’s new cookbook Oaxaca al Gusto that was just released in english. My girlfriend just gave it to me and I think we have many happy meals ahead of us. Hi Frank, we tried to get in contact with her for this project, but she was unavailable. I’ll have to wait until we’re done with this project before I buy any cookbooks! (went end of Nov). At cirst I was disapointed that one class was going to be only on salsas. Since I live in Texas I thought I knew all about salsa! I was totally wrong of course and I learned several totally different salsas, how to choose and treat fresh and dry chilies,what to use then for. The second class was solely devoted to mole. It was so interesting to learn about the many stages of preparation which each produces a salsa in itself. French cooking is my native cooking and I taught Marilau how to make chocolate mousse ! She told me where to find Callebaut chocolate for it … in a delicious pastry store. Wish I coukd have stay a few more days and attend more classes since can find all the authentic ingredients here. 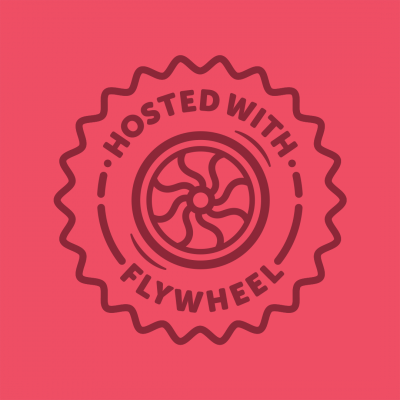 PS I just discovered your site and love it! Congratulations.